Make the chimichurri: In a food processor, add parsley, cilantro, garlic, red pepper chili flakes, lemon juice, oregano, shallot and red wine vinegar. Pulse until combined. Run the processor and slowly drizzle in olive oil. Season to taste. Set aside. Heat a grill to medium flame. Toss carrots with oil, salt and pepper. Place carrots on the grill and turn occasionally until tender, about 20 minutes. 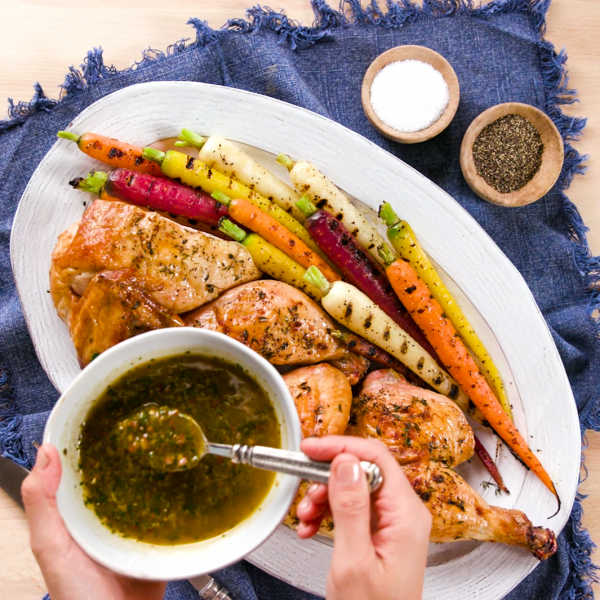 To assemble: Spread a thin layer of chimichurri on a platter, pile grilled carrots and drizzle remaining chimichurri over the carrots. Season to taste.